This chapter charts the rise of permitted development, explaining how successive governments have increased the amount and type of activity possible in England without planning permission as part of a broader series of planning reforms. The government’s aims for these reforms are considered. 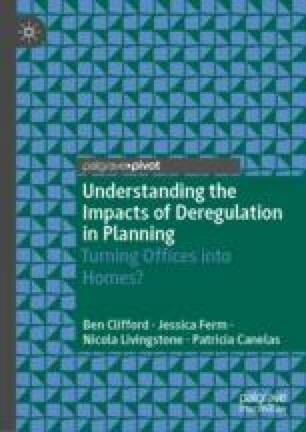 The chapter also introduces the book as a whole, explaining the extent of office-to-residential change of use seen since the deregulation was introduced in 2013, the need to consider the topic because of its direct impacts on the built environment and communities, but also the need to look at this more generally to understand how planning works (and is being undermined). The chapter concludes with an outline of the rest of the book to follow. Blears, H. (2008). ‘Beauty vs. Brutality’: Speech to CABE. http://www.communities.gov.uk/speeches/corporate/beautyvsbrutality. Accessed 8 August 2008. DCLG. (2013a). New Measures to Breathe Life into Empty Buildings and Boost Growth. https://www.gov.uk/government/news/new-measures-to-breathe-life-into-empty-buildings-and-boost-growth. Accessed 28 October 2017. DCLG. (2013b). Relaxation of Planning Rules for Change of Use from Offices to Residential: Impact Assessment. https://www.gov.uk/government/uploads/system/uploads/attachment_data/file/207922/Relaxation_of_planning_rules_for_change_of_use_from_offices_to_residential_-_impact_assessment.pdf. Accessed 1 November 2017. DCLG. (2015). Thousands More Homes to Be Developed in Planning Shake Up. https://www.gov.uk/government/news/thousands-more-homes-to-be-developed-in-planning-shake-up. Accessed 28 October 2017. May, T. (2018). PM Speech on Making Housing Fairer: 5 March. https://www.gov.uk/government/speeches/pm-speech-on-making-housing-fairer-5-march. Accessed 29 August 2018. UK Parliament. (2013). Change of Use: Promoting Regeneration. https://www.gov.uk/government/speeches/change-of-use-promoting-regeneration. Accessed 28 October 2017.